This is an archive of past Oblivion talk:Oblivion Gates discussions. Do not edit the contents of this page, except for maintenance such as updating links. 5 Should this be merged with Planes of Oblivion? 7 How many must be closed for 100% completion? 11 Daedra outside the gates. 15 How to enter a gate? 19 Console Command that opens the gates back up? 22 25 gates, including the Kvatch gate? Despite most of places in Tamriel seem to be fixed, I think that many Oblivion gates open in random places. I closed many gates that are not where this article says, and I too couldn't find many of those described here. Can someone confirm? Confirmed. A while back I found an oblivion gate on the road west of Skingrad right before my game crashed. I reloaded to a point a few minutes earlier, no gate! Also, the rate at which Gates appear is dependent on where you are in the main quest. Between getting Martin to Cloud Ruler and getting the book, they're relatively rare. After that, the city-specific gates pop up and you can't go five feet without three random ones appearing. I think the gates are not totally random. Due to an obvious graphical limitation in the engine, the game can't generate random gates everywhere. There are simply a large number of possible places where gates will randomly appear. To my horror i saw that this page had several bad errors, and missing info. It fasly stated that oblivion gates reopen. The variable mq00.allowgatestoreopen is never set to 1, and it is therefore impossible for a gate to reopen. The guide states that they do, but they DONT. added the two last MQ locations where the gate variaiables are changed. Should this be merged with Planes of Oblivion? Your "Oblivion Gates Shut" statistic will state that you have closed 59 (not 60) gates, because the Great Gate does not count towards this statistic. There have also been some related notes added to 100% Completion in the last week by another editor, so it seems that someone else has also been able to get the Great Gate to count (although in my case I definitely did not have to wait until I'd closed another gate). How many must be closed for 100% completion? 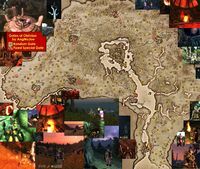 One thing I did not see mentioned in the article is whether the daedra respawn after the gate has been closed. I think they do, and this can be annoying when traveling past a closed gate that is roadside. Sure, Nephele, and actually your statement is a good example of where I think the disconnect is for me. You wrote, "you can have a maximum of 50 gates open" - "CAN" - not "WILL" - so it is random then, and one may or may not get the highest possible number to open (50 in this case, plus the tend mandatory ones for a total of 60). Then my question is that at places in the article, it mentions that certain actions will increase the probability of gates opening, so what are those actions specifically (or are they just the one or two quest completions that are listed)? Also, if I go to a gate area and it randomly determines not to spawn a gate, can I go back later and it checks again, so that as long as I keep visiting areas I'll eventually get 60 gates to open? Does it check every time I visit an area or just once? Or does it check once at the end of one of the quest missions, and then check again at the end of another quest mission that changes the probability of a gate opening? The confusion in this case might be from lack of an in-depth answer. There's simply not enough information there for me to be able to tell what's going on with the gates. The questions I asked (if answers are available) will probably help lend clarity to the matter overall. This seems to me to be a case of "It makes perfect sense to those of us that already know how it works." "If a gate didn't open earlier, then exiting and re-entering the cell triggers the 50% chance again." Thus, to get the gates open one simply needs to keep going around to the gates. Failing a roll once does not mean that gate will never open. Simply exit the area, come back in and it will check again. A new update: I got a PM on the Oblivion boards from another member. She wrote: "There is timing involved with the gates, and chance -they don't just all plop open. I know this because I have been, across four different characters, on a mission to try and close all 60, something I have not done, though not for lack of trying." How to enter a gate? Console Command that opens the gates back up? Firstly, what is a GMST? a GMST record is an entry in the game's data files used to set various game parameters. there is an OblivionCrisis GLOB, which is one of countless global variables used by the game scripts. All I know offhand is that it's set when Oblivion gates start appearing. I'd guess it's used to trigger various NPC dialogues, but without knowing why it even matters, I don't particularly want to spend the time poring through dialogue conditions to confirm. 25 gates, including the Kvatch gate? Hey, I am wondering if the Oblivion gates is opens just in Cyrodiil or is it opens in all the Tamiriel? You know Morrowind, Skyrim, Hammerfell etc etc. This page was last modified on 23 March 2013, at 05:00.